Period: 1820-1830: George IV	Categories: 1820-1830: George IV, Tableware Ref: 24256/24184? 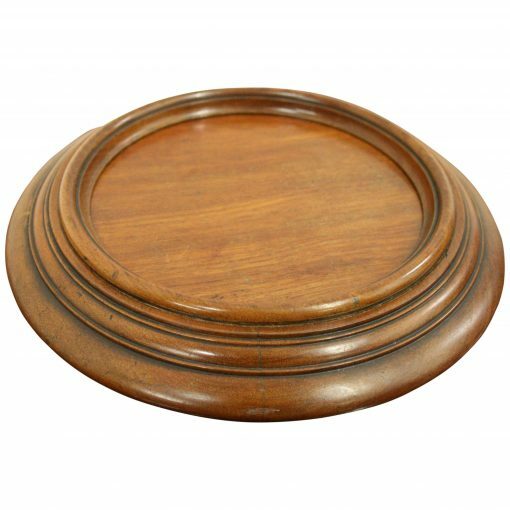 Circa 1830, a late George IV mahogany circular wine coaster most likely by Mein of Kelso. 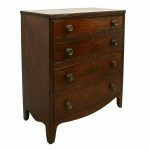 The solid mahogany piece has a large circular flange top with ogee moulding. It has a simple moulding on the inside of the top. The underside of the coaster continues down to a large circular flange which is raised and inside of this there are a few classic features of this kind of piece: brass castors and leather wheels. The leather wheels were used to push along the dining table to prevent it from leaving any markings on a table or other surfaces. There is a burn mark in the centre where the piece has been laid. 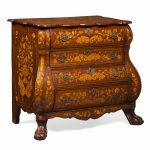 It’s an unusual piece of late Georgian furniture, and is very stylish. Size 6cm high x 25cm diameter. 6cm high x 25cm diameter.